Anyone else going to be there, enjoying some great bikes, chips with too much mayo, fine Belgian beers and the worlds best racing circuit. Thursday night ferry to Rotterdam - be at Spa around lunchtime Friday. Watch out for around 20 smokey UK reg'd H2 Kawasakis being expertly marshalled by a lone Bimota. I'm hotelling it in Spa, the commoners are sleeping in a field. Saving all their money for fuel and 2T oil. 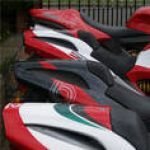 Which bimota wil you be on GeeKay? Will deffo look you up Geekay - sold my H2 about 2 years back so will be keen to admire a group of fine ring a ding triples. I'm meeting a load of my UK mates and we are staying in Spa also. Pierre something hotel. There are 3 groups of UK-based H2's converging on Spa, 20+ Frenchies, the Netherlands group and the Baltic countries mob. Its the 40th anniversary of the original H2 and the Z1 this year. I'm staying in the Hotel Source de la Geronstade in Spa - will pm you my mobile and meet up Friday night for a drink or 2? Saturday night is the 4hr endurance race - starts at 20:30 - so I'll be at the circuit most of the night. Sounds great - really looking forward to it - look out for a tall bald bloke in a triples T shirt! See you there - I'll be on the most boring - probably a VW Golf or similar. I fly from Spain into Brussels Friday lunchtime. Once again, very jealous. have fun chaps! call this number, it's actually not too far away from me ! 3 KB1 s tried to qualify for the 4 hour race, but I don't remember seeing a single Bimota on the track at any time ?? must have been having a nap- but it looks like the KB1 s didn't qualify . .
this bloke was enjoying himself too. I didn't get a single pic of you on the track Garry you must be too fast- but you should be on the video- when I get that sorted out . .
brilliant place, brilliant event, we could all meet up there next year- have a club stand and support whoevers going to buy the YB4 ! and it didn't even rain on Saturday or Sunday. Thats an amazing collection of bikes, thanks for posting the pics. Nice to see one of Gaz and the Muntra! Great weekend with great weather too! Good to meet up with you both. Garry saw you riding up the road with the triples guys, after the Tour de France had gone through. excellent weekend with great bikes, great weather and great company too! Pleased to have met up with both Paul and Ian - both great guys. Icing on the cake was the 4 laps of the circuit - top fun. I've left all the "official" forum photography to Ian - I'll add a couple of meaningless pics later. Hope your video is OK Ian - very rare for a Mantra to be leading the pack for an an entire lap! Roll on the August Bim-Fest in Germany!! !